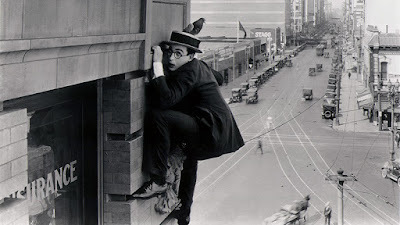 Sure, the papers would probably have mentioned if Harold Lloyd had really splattered all over downtown Los Angeles, but this plucky little bugger with his horn-rimmed glasses and straw hat was no blob of pixels. He was an everyday Joe who had to deal with everyday problems like work and romance and gravity. The character he played was no daredevil either; he was just a guy who somehow found himself in a situation (OK, he did it to himself) where he had to scramble up a massive building one hardscrabble story at a time, facing brand new obstacles at each leg of the journey: pigeons, badminton nets, spinning anemometers, and the most famous clock in the history of cinema. He fell or almost fell time and time again, and audiences gasped each time, and then laughed when he recovered, and then gasped again at the next setback. The real Harold Lloyd might have had a safety mattress waiting for him on a platform about ten feet below, but even with a partially prosthetic hand (he had lost a couple fingers to a prop bomb that turned out to be a little too real) he was really letting it all hang out, his feet swinging free over the city streets as he dug his fingers, both real and fake, into ledges or dangled from the giant hands of a malfunctioning clock, finding a way to drag his body past overhangs that hung way, way over. The twenty-minute climb was the ultimate expression of a decade defined by daring stunts (human flies and flagpole sitters were all the rage) and it is certainly one of the defining sequences of silent cinema. 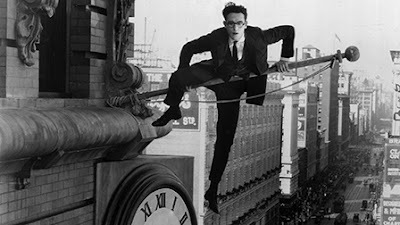 By now, Harold Lloyd's name has been restored to its proper place in the history books, but he is still generally viewed as silent comedy's “third genius” after Charlie Chaplin and Buster Keaton. Lloyd was just as popular in his day, but he held closely to the rights to all his films and didn't care to see them played on television where he had no control over broadcast editing, so his public profile diminished relative to his fellow geniuses. Film buffs and historians never let his memory fade, but it took plenty of heavy lifting to get his films back in circulation, an effort that got an extra boost from the advent of the DVD market. “Safety Last!” (1923) remains the best known of his movies and with good reason. By the early-'20s, Lloyd had moved on from his Tramp-knockoff character Lonesome Luke and perfected his signature Glasses Character who could be meek or aggressive, sly or buffoonish, but always used those trademark glasses (no lenses, mind you) to forge a direct connection with the audience. Where Chaplin was an alien and Keaton was some kind of superhero, Lloyd as Glasses was an everyman. In “Safety Last!” he is a country lad who moves to the big city to make his fortune before he sends for the love of his life, played by Mildred Davis who also turned out to be the love of Lloyd's life. He works in a department store where he is unappreciated by his bosses and by his demanding customers, but never gives anything less than maximum effort, not for a second. That was Lloyd's trademark as a craftsman and a performer as well. Never content to tell one joke, he constructed elaborate gags that led to other gags and then still more, a series of rapid-fire payoffs that kept audiences on their toes. Screenwriting manuals have turned the word “obstacle” into a risible cliché, but Lloyd knew all about obstacles and how to make viewers care as they watched him overcome one after another on top of another stacked inside of still another. Escalating action? Yeah, escalating right up a damn building! The situations were utterly implausible but completely believable because of Lloyd's intense, wired physical presence. Forever hanging from that clock, he is the avatar of a heroic age of filmmaking where bodies defied gravity because they had no choice. It wasn't going to get fixed in post-production. No digital buffing or polishing, just sinew and sheer tenacity. We'll never see anything like it again, but that's OK because ninety years of evidence has proven that nobody's ever going to do it better. The film is presented in its original 1.37:1 aspect ratio. From the Criterion booklet, “The film is also presented at a variable frame rate of approximately 22 frames per second to conform to film historian Kevin Brownlow's presentation and the Carl Davis score that accompanies it.” It's a 1080i transfer, a rare interlaced high-def effort from Criterion, but the interlacing is barely noticeable at all. There are scratches and bits of debris evident from the source material at times, but overall this high-def transfer is pretty spectacular with a rich gain structure and shockingly detailed image quality throughout. For anyone used to settling for whatever version you could find in the '80s and even for folks familiar with the solid but unspectacular SD release in 2005, this upgrade is quite a revelation. Crisp, sharp contrast, everything you could ask for. This movie is 90 years old? As you may know, silent films were seldom played silently. Criterion offers two scores. The default option is a jazzy orchestral score by Carl Davis, recorded in 1989. Second is a score by organist Gaylord Carter that was improvised to a screening of the film circa 1969. Carter is described as Lloyd's favorite theater organist. The Davis score is presented in stereo, the Carter score in mono, though I don't think you can tell much difference on that front. I prefer the Davis score, but they're both worth sampling. Both sound sharp and resonant in linear PCM mixes. 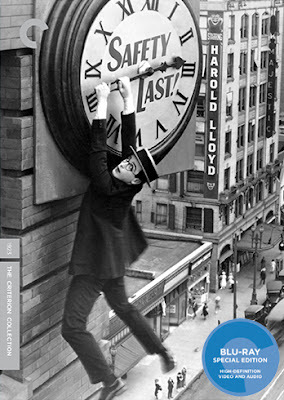 Some of the extras were included on the SD release in New Line's 2005 “Harold Lloyd Comedy Collection” while others are new for this Criterion release. The commentary track (offered on the SD) was recorded in 2005 and features critic Leonard Maltin in conversation with Harold Lloyd's archivist Richard Correll. It's rather breezy in nature and features a lot of scene-by-scene appreciations (Wow, isn't this awesome!) but also includes some historical and contextual information. Overall, it's mildly disappointing but of some interest. Criterion has included an introduction (17 min.) by Suzanne Lloyd, Harold's granddaughter who was raised in Mr. Lloyd's house. I don't know if this was included on the old SD or is new for this set. “Harold Lloyd: The Third Genius” (1989, 108 min.) is a great two-part television documentary directed by Kevin Brownlow and David Gill and narrated by director Lindsay Anderson. The program, originally presented as part of the American Masters series, is essential viewing for any Lloyd aficionado and includes ample archival footage along with interviews with Lloyd's collaborators, including producer/director Hal Roach. “Locations and Effects” (2013, 20 min.) is a new interview with writer John Bengtson and visual effects expert Craig Barron which provides a fascinating analysis of both the downtown Los Angeles locations featured in the movie (notice the three different buildings visible in the background as Glasses makes his climb) and the effects used. Finding out about the tricks used will only leave you more amazed by the movie. Criterion has also included a new interview with composer Carl Davis (2013, 24 min.) who talks about his work on “Safety Last!” and other silent films he has composed new scores for since the '80s. Best of all, we also get new restorations of three of Lloyd's short films: “Take a Chance” (1918), “Young Mr. Jazz” (1919), and “His Royal Slyness” (1920). None of these films were included on the New Line boxed set. Each film comes with optional commentary tracks by Richard Correll and John Bengtson. “Safety Last!” has finally received the home theater presentation it deserves. Of course it's highly recommended.